How much does office ergonomics really matter? According to the World Health Organization, one-third of health-related absences are due to musculoskeletal disorders. Back pain accounts for 60 percent of these injuries, followed by neck pain and wrist pain. Other studies conducted on State Farm Insurance and Blue Cross-Blue Shield found that productivity improved by a measure of 15 and 4.4 percent, respectively, after ergonomic upgrades. It is tempting to assume that if employees don’t suffer from musculoskeletal disorders, then ergonomics initiatives won’t generate value. Assuming that without ergonomic equipment and education your employees will indefinitely remain healthy is a significant gamble. Ergonomic-related injuries frequently cause decreased productivity, increased absenteeism and lowers employee engagement. 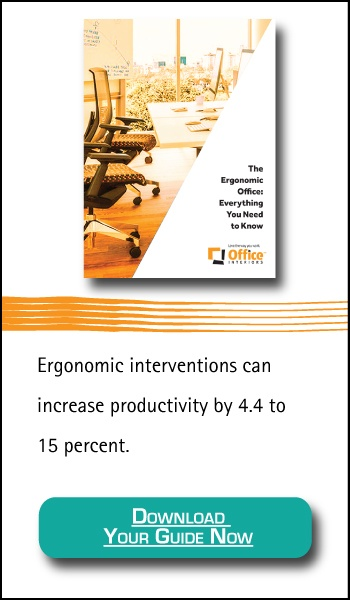 But beyond the liabilities associated with inaction, there are positive incentives for incorporating ergonomics into your office environment. Employee Well-Being Improves Productivity. According to a 2015 Willis Towers Watson study, employees who report feeling like their supervisors care for their well-being work harder and generate more profit than those that don’t. In fact, the study goes so far as to say this factor is the single highest driver of employee engagement. Employee Comfort Generates Higher Working Capacities. Workers who suffer from painful conditions have trouble concentrating. These employees report feeling drained and tired early on in the work day and take frequent breaks. Furthermore, improper ergonomics reduces creativity. Comfortable Employees Make Fewer Errors. Whether typing at a computer, standing behind a reception counter or working on an assembly line, employees who benefit from ergonomic assessments and equipment make fewer mistakes. BLR notes that for one company, a single $400 device prevented $6000 in annual scrap costs, generating a 1500 percent return on the investment every year. In a 2000 study in the Journal of Occupational Rehabilitation, office workers who chose to participate in ergonomics education reported less wrist pain and psychosocial stress than workers who had no training. Importantly, they also noted less pain and better stress management than workers who were compelled to participate in traditional ergonomics education courses. These findings make a case for making ergonomics education a fundamental part of workplace culture, rather than a superficial initiative pursued solely to obtain credentials. employees will use the ergonomic equipment according to modern best practices. The second part is a crucial element to using ergonomics to generate value. Most top-down ergonomics initiatives fail to inspire employees to maintain appropriate postures and work habits long-term. Any extensive ergonomics initiative should begin with an ergonomics assessment. Hiring a Certified Ergonomics Assessment Specialist to review your office’s layout rarely takes more than a few hours and can generate significant revenue in the future. Industrial workplaces may find that an ergonomics assessment costs more, usually because of the many unique factors that must be taken into consideration on the modern factory floor. Developing an ergonomic solution is more involved in these cases when employees are not necessarily uniformly seated and facing computer screens. However, it is in industrial and mixed environments that ergonomic assessments are most important. Workflows that involve heavy machinery offer far more potential causes of musculoskeletal disorders, including back pain, neck pain, and wrist pain. Is There an Easier Place to Start? Ensure everyone working at a desk has an adjustable monitor arm and keyboard tray. Provide a task/desk lamp for anyone who works extensively with paper documents. Add a desktop height-adjustable worksurface accessory (such as the Quickstand or the WorkFit) to the workstations of team members with existing ergonomic health concerns. Upgrading any task chairs that don’t have armrests and adjustable backrest. Want to learn more about office ergonomics? 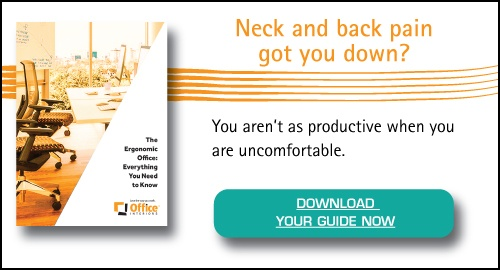 Read our complete guide to Office Ergonomics to find answers to any ergonomic questions you may have! Once you feel ready to start improving the ergonomic situation of your workplace, or if you just want an experienced opinion on where your office stands, we are here to help. We can work with you to identify what ergonomic changes or interventions will have the best impact on the health and productivity of your team, as well as your bottom line. Give us a call today!